ONE person donating ONE dollar is a powerful thing. 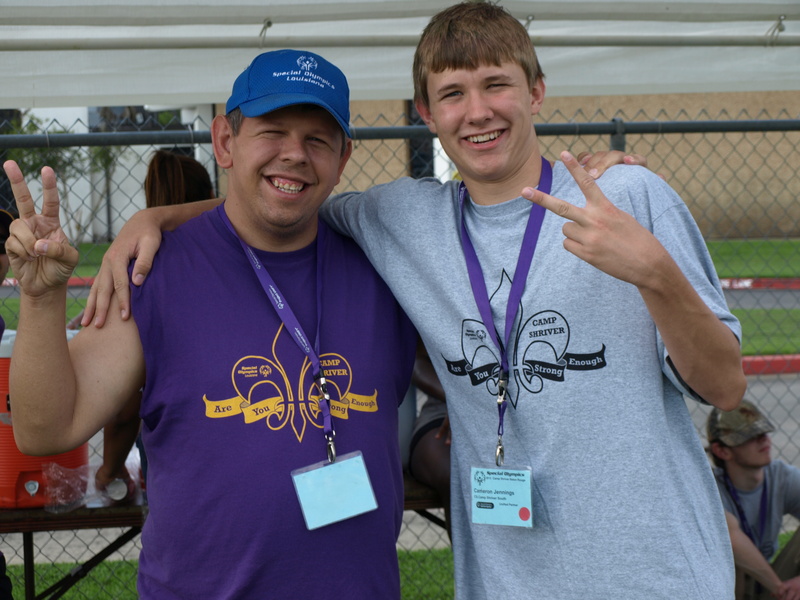 Especially if that thing is Team Louisiana competing in the 2014 Special Olympics USA Games this summer. We are sending a delegation of 101 to New Jersey this June to compete on a national stage! It costs $100,000 to send our delegation to the games and we need your help. Please consider donating to Team Louisiana, every dollar counts. Meet Team Louisiana. 2. 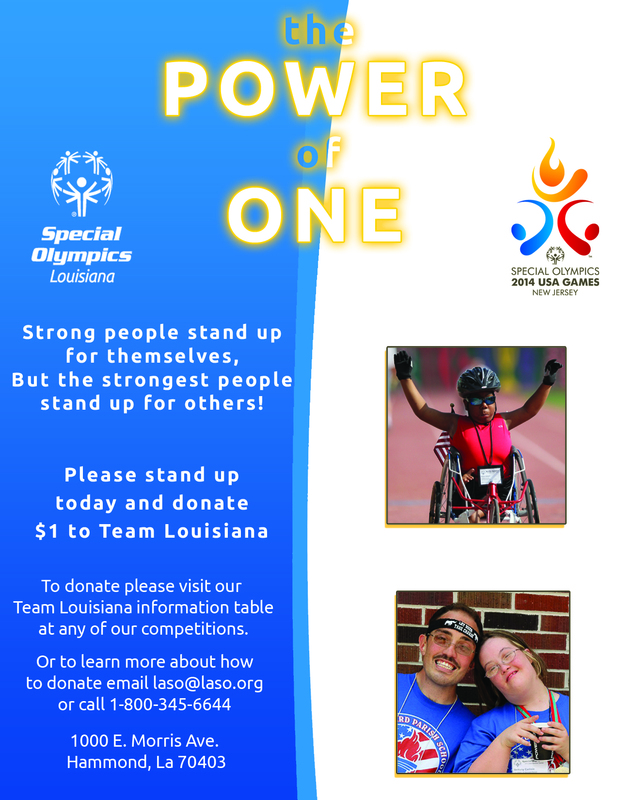 Visit a Power of One volunteer at any Special Olympics Louisiana competition. 3. 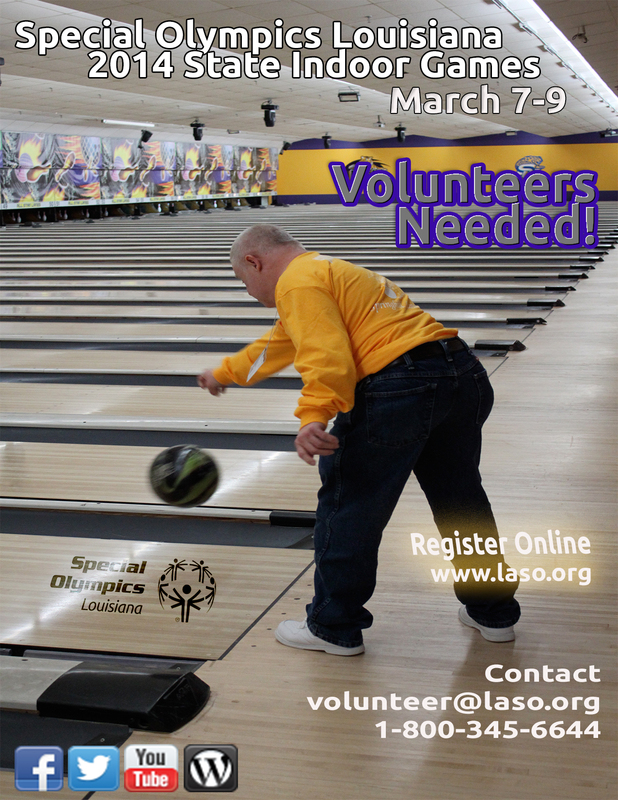 Mail a check to Special Olympics Louisiana, Inc, 1000 East Morris Avenue, Hammond, LA 70403. In the memo please write Team Louisiana. Check out the highlight video of Jacob below. You can view some pictures here. State Indoor Games will take place next week, March 7-9 in Baton Rouge , LA! Over 600 athletes will compete in basketball, bowling, and tennis. We will kick the weekend off with Opening Ceremonies on the LSU Parade Ground for 7pm and all are welcome to attend. Basketball, bowling, and tennis competition will begin bright and early Saturday, March 8th at 8am. Starting at 10am, Healthy Athletes and Olympic Town will start offering free non-evasive health screenings and fun interactive games for our athletes. The famous Victory Dance/Closing Ceremonies will take place Saturday night and competition will come to a close early Sunday afternoon. Interested in volunteering? If so, sign up here! Be sure to connect with us on Facebook and Twitter so you can stay updated during 2014 State Indoor Games. See you in Baton Rouge! **Below is a guest post from Athlete Representative, Darryl Robinson. I recently sat down at the Special Olympics Louisiana State Office to talk about Get Fit For Sport. Click below to see the video message I recorded just for you! Be sure to sign up by this Sunday, March 2nd! Once you do, you will be able to join me on a path of training and eating healthy. 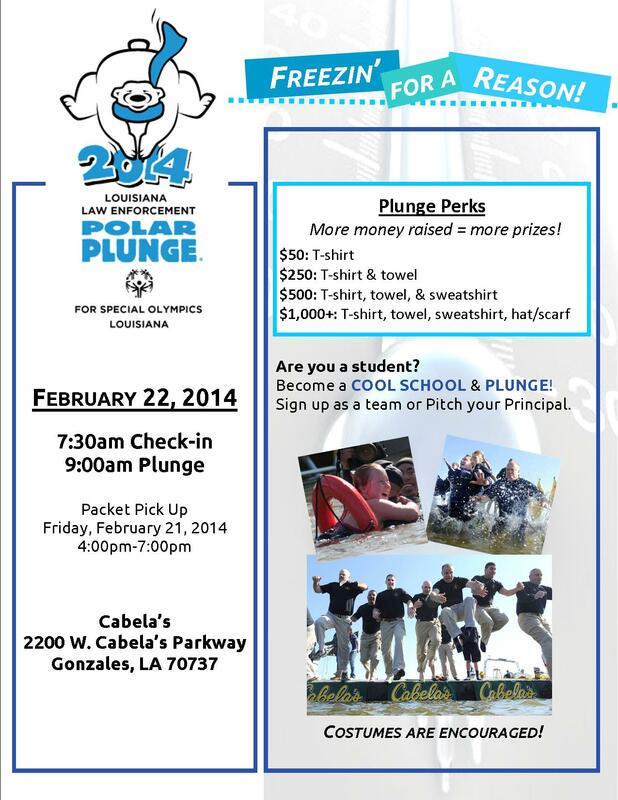 The third and final Polar Plunge of the year will take place this Saturday, February 22nd in Gonzales, LA at Cabela’s (2200 W. Cabela’s Pkwy, Gonzales, LA 70737). There are more than 100 people who have already signed up to plunge on Saturday including a few of our Special Olympics Louisiana Athletes! 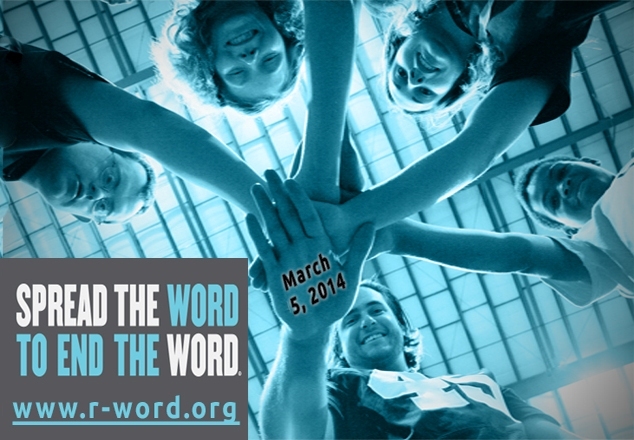 If you are interested in plunging, it is not to late… Click here to register! Once you do, head over to our Facebook page and tell us why you will be Freezin’ For A Reason! Thank you to all who have registered to plunge and to our generous Sponsors! We look forward to seeing you all this weekend at Polar Plunge!